"Owen Glendower" redirects here. For novel by John Cowper Powys, see Owen Glendower (novel). Owain Glyndŵr (Welsh pronunciation: [ˈoʊain ɡlɨ̞nˈduːr]; c. 1359 – c. 1415), or Owain Glyn Dŵr (Latin: Oenus de Glendor(dee)), sometimes called Owen Glendower in English, was a Welsh ruler and the last native Welshman to hold the title Prince of Wales (Tywysog Cymru). He instigated a fierce and long-running, yet ultimately unsuccessful war of independence with the aim of ending English rule in Wales. Glyndŵr was a descendant of the Princes of Powys through his father Gruffudd Fychan II, hereditary Tywysog of Powys Fadog and Lord of Glyndyfrdwy, and of those of Deheubarth through his mother Elen ferch Tomas ap Llywelyn ab Owen. On 16 September 1400, Glyndŵr instigated the Welsh Revolt against the rule of Henry IV of England. The uprising was initially very successful and rapidly gained control of large areas of Wales, but it suffered from key weaknesses – particularly a lack of artillery, which made capturing defended fortresses difficult, and of ships, which made their coastlands vulnerable. The uprising was eventually suppressed by the superior resources of the English. Glyndŵr was driven from his last strongholds in 1409, but he avoided capture and the last documented sighting of him was in 1412. He twice ignored offers of a pardon from his military nemesis, the new king Henry V of England, and despite the large rewards offered, Glyndŵr was never betrayed to the English. His death was recorded by a former follower in the year 1415. In William Shakespeare's play Henry IV, Part 1, the character of Owen Glendower is a wild and exotic king ruled by magic and emotion. With his death Owain acquired a mythical status along with Cadwaladr, Cynan and Arthur as the hero awaiting the call to return and liberate his people. In the late 19th century, the Cymru Fydd movement recreated him as the father of Welsh nationalism. Banner of Owain Glyndŵr. Arms: Quarterly or and gules, four lions rampant armed and langued azure counterchanged. Crest. A dragon, or wyvern, gules. Mantling. Red lined white. Glyndŵr was born around 1349 (possibly 1359) to a prosperous landed family, part of the Anglo-Welsh gentry of the Welsh Marches (the border between England and Wales) in northeast Wales. This group moved easily between Welsh and English societies and languages, occupying important offices for the Marcher Lords while maintaining their position as uchelwyr — nobles descended from the pre-conquest Welsh royal dynasties — in traditional Welsh society. His father, Gruffydd Fychan II, hereditary Tywysog of Powys Fadog and Lord of Glyndyfrdwy, died some time before 1370, leaving Glyndŵr's mother Elen ferch Tomas ap Llywelyn of Deheubarth a widow and Owain a young man of 16 years at most. The young Owain ap Gruffydd was possibly fostered at the home of David Hanmer, a rising lawyer shortly to be a justice of the Kings Bench, or at the home of Richard FitzAlan, 3rd Earl of Arundel. Owain is then thought to have been sent to London to study law at the Inns of Court. He probably studied as a legal apprentice for seven years. He was possibly in London during the Peasants' Revolt of 1381. By 1383, he had returned to Wales, where he married David Hanmer's daughter, Margaret, started his large family and established himself as the Squire of Sycharth and Glyndyfrdwy, with all the responsibilities that entailed. Glyndŵr entered the English king's military service in 1384 when he undertook garrison duty under the renowned Welshman Sir Gregory Sais, or Sir Degory Sais, on the English–Scottish border at Berwick-upon-Tweed. In August 1385, he served King Richard under the command of John of Gaunt again in Scotland. On 3 September 1386, he was called to give evidence in the Scrope v Grosvenor trial at Chester. In March 1387, Owain was in southeast England under Richard Fitzalan, 11th Earl of Arundel, in the English Channel at the defeat of a Franco-Spanish-Flemish fleet off the coast of Kent. Upon the death in late 1387 of his father-in-law, Sir David Hanmer, knighted earlier that same year by Richard II, Glyndŵr returned to Wales as executor of his estate. He possibly served as a squire to Henry Bolingbroke (later Henry IV of England), son of John of Gaunt, at the short, sharp Battle of Radcot Bridge in December 1387. He had gained three years' concentrated military experience in different theatres and seen at first hand some key events and people. King Richard was distracted by a growing conflict with the Lords Appellant from this time on. Glyndŵr's opportunities were further limited by the death of Sir Gregory Sais in 1390 and the sidelining of Richard Fitzalan, Earl of Arundel, and he probably returned to his stable Welsh estates, living there quietly for ten years during his forties. The bard Iolo Goch ("Red Iolo"), himself a Welsh lord, visited him in the 1390s and wrote a number of odes to Owain, praising Owain's liberality, and writing of Sycharth, "Rare was it there / to see a latch or a lock." Brother Tudur, Lord of Gwyddelwern, born about 1362, died 11 March 1405 at a battle in Brecknockshire in the wars of his brother. Brother Gruffudd who had a daughter and heiress, Eva. Sister Lowri, also spelled Lowry, married Robert Puleston of Emral. Sister Isabel married Adda ap Iorwerth Ddu of Llys Pengwern. Sister Morfudd married Sir Richard Croft of Croft Castle, in Herefordshire and, secondly, David ab Ednyfed Gam of Llys Pengwern. Tudur, Isabel and Lowri are given as his siblings by the more cautious Prof. R R Davies. That Owain Glyndŵr had another brother Gruffudd is likely; that he possibly had a third, Maredudd, is suggested by one reference. In the late 1390s, a series of events began to push Owain towards rebellion, in what was later to be called the Welsh Revolt, the Glyndŵr Rising or (within Wales) the Last War of Independence. His neighbour, Baron Grey de Ruthyn, had seized control of some land, for which Glyndŵr appealed to the English Parliament. Owain's petition for redress was ignored. Later, in 1400, Lord Grey informed Glyndŵr too late of a royal command to levy feudal troops for Scottish border service, thus enabling him to call the Welshman a traitor in London court circles. Lord Grey was a personal friend of King Henry IV. Glyndŵr lost the legal case, and was under personal threat. However, an alternative source states that Glyndŵr was under threat because he had written an angry letter to Lord Grey, boasting that he had stolen some of Lord Grey's horses, and believing Lord Grey had threatened to "burn and slay" within his lands, he threatened retaliation in the same manner. Lord Grey then denied making the initial threat to burn and slay, and replied that he would take the incriminating letter to the King Henry IV's council, and that Glyndŵr would hang for the admission of theft and treason contained within the letter. The deposed king, Richard II, had support in Wales, and in January 1400 serious civil disorder broke out in the English border city of Chester, after the public execution of an officer of Richard II. These events led to Owain formally assuming his ancestral title of Prince of Powys on 16 September 1400 at his Glyndyfrdwy estate. With a small band of followers which included his eldest son, his brothers-in-law, and the Bishop of St Asaph in the town of Corwen, possibly in the church of SS Mael & Sulien, he launched an assault on Lord Grey's territories. After a number of initial confrontations between King Henry IV and Owain's followers in September and October 1400, the revolt began to spread in 1401. Much of northern and central Wales went over to Owain. Henry IV appointed Henry Percy – the famous "Hotspur" – to bring the country to order. Hotspur issued an amnesty in March which applied to all rebels with the exception of Owain and his cousins, Rhys ap Tudur and Gwilym ap Tudur, sons of Tudur ap Gronw (forefather of King Henry VII of England). Both the Tudurs were pardoned after their capture of Edward I’s great castle at Conwy. Monument to Owain Glyndŵr's victory at the Battle of Mynydd Hyddgen in 1401. In June, Owain scored his first major victory in the field at Mynydd Hyddgen on Pumlumon. Retaliation by Henry IV on the Strata Florida Abbey followed, but eventually led to Henry's retreat. In 1404, Owain held court at Harlech and appointed Gruffydd Young as his Chancellor. Soon afterwards, he called his first Parliament (or Cynulliad or "gathering") of all Wales at Machynlleth, where he was crowned Prince of Wales and announced his national programme. He declared his vision of an independent Welsh state with a parliament and separate Welsh church. There would be two national universities (one in the south and one in the north) and a return to the traditional law of Hywel Dda. Senior churchmen and important members of society flocked to his banner. English resistance was reduced to a few isolated castles, walled towns and fortified manor houses. Owain Glyndŵr's Parliament House, Machynlleth, pictured in 1814. In February 1405, Owain negotiated the "Tripartite Indenture" with Edmund Mortimer and Henry Percy, Earl of Northumberland. The Indenture agreed to divide England and Wales among the three of them. Wales would extend as far as the rivers Severn and Mersey, including most of Cheshire, Shropshire and Herefordshire. The Mortimer Lords of March would take all of southern and western England and the Percys would take the north of England. R. R. Davies noted that certain internal features underscore the roots of Glyndŵr's political philosophy in Welsh mythology: in it, the three men invoke prophecy, and the boundaries of Wales are defined according to Merlinic literature. Although negotiations with the lords of Ireland were unsuccessful, Owain had reason to hope that the French and Bretons might be more welcoming. He dispatched Gruffydd Young and his brother-in-law (Margaret's brother), John Hanmer, to negotiate with the French. The result was a formal treaty that promised French aid to Owain and the Welsh. The immediate effect seems to have been that joint Welsh and Franco-Breton forces attacked and laid siege to Kidwelly Castle. The Welsh could also count on semi-official fraternal aid from their fellow Celts in the then independent Brittany and Scotland. Scots and French privateers were operating around Wales throughout Owain's war. Scottish ships had raided English settlements on the Llŷn Peninsula in 1400 and 1401. In 1403, a Breton squadron defeated the English in the Channel and devastated Jersey, Guernsey and Plymouth, while the French made a landing on the Isle of Wight. By 1404, they were raiding the coast of England, with Welsh troops on board, setting fire to Dartmouth and devastating the coast of Devon. 1405 was the "Year of the French" in Wales. A formal treaty between Wales and France was negotiated. On the continent the French pressed the English as the French army invaded English Plantagenet Aquitaine. Simultaneously, the French landed in force at Milford Haven in west Wales. They marched through Herefordshire and on into Worcestershire. They met the English army just ten miles from Worcester. The armies took up battle positions daily and viewed each other from a mile without any major action for eight days. Then, for reasons that have never become clear, the Welsh retreated, and so did the French shortly afterwards. By 1405, most French forces had withdrawn after politics in Paris shifted toward the peace party. Early in the year, the Welsh forces, who had until then won several easy victories, suffered a series of defeats. English forces landed in Anglesey from Ireland and would over time push the Welsh back, until the resistance in Anglesey formally ended toward the end of 1406. At the same time, the English changed their strategy. Rather than focusing on punitive expeditions as favoured by his father, the young Prince Henry adopted a strategy of economic blockade. Using the castles that remained in English control, he gradually began to retake Wales while cutting off trade and the supply of weapons. By 1407 this strategy was beginning to bear fruit, even though by this time Owain's rebel soldiers had achieved victories over the King's men as far as Birmingham, where the English were in retreat. In the autumn, Owain's Aberystwyth Castle surrendered while he was away fighting. In 1409, it was the turn of Harlech Castle. Edmund Mortimer died in the final battle, and Owain's wife Margaret along with two of his daughters (including Catrin) and three of Mortimer's granddaughters were imprisoned in the Tower of London. They were all to die in the Tower before 1415. Owain remained free, but he had lost his ancestral home and was a hunted prince. He continued the rebellion, particularly wanting to avenge his wife. In 1410, after a suicide raid into rebel-controlled Shropshire, which took many English lives, some of the leading rebels are thought to have been captured. In 1412, Owain led one of the final successful raiding parties with his most faithful soldiers and cut through the King's men; and in an ambush in Brecon he captured, and later ransomed, a leading Welsh supporter of King Henry's, Dafydd Gam ("Crooked David"). This was the last time that Owain was seen alive by his enemies. As late as 1414, there were rumours that the Herefordshire-based Lollard leader Sir John Oldcastle was communicating with Owain, and reinforcements were sent to the major castles in the north and south. But by then things were changing. Henry IV died in 1413 and his son King Henry V began to adopt a more conciliatory attitude to the Welsh. Royal pardons were offered to the major leaders of the revolt and other opponents of his father's regime. Nothing certain is known of Owain after 1412. Despite enormous rewards being offered, he was neither captured nor betrayed. He ignored royal pardons. Tradition has it that he died and was buried possibly in the church of Saints Mael and Sulien at Corwen close to his home, or possibly on his estate in Sycharth or on the estates of his daughters' husbands — Kentchurch in south Herefordshire or Monnington in west Herefordshire. In his book The Mystery of Jack of Kent and the Fate of Owain Glyndŵr, Alex Gibbon argues that the folk hero Jack of Kent, also known as Siôn Cent – the family chaplain of the Scudamore family – was in fact Owain Glyndŵr himself. Gibbon points out a number of similarities between Siôn Cent and Glyndŵr (including physical appearance, age, education, and character) and claims that Owain spent his last years living with his daughter Alys, passing himself off as an aging Franciscan friar and family tutor. There are many folk tales of Glyndŵr donning disguises to gain advantage over opponents during the rebellion. Adam of Usk, a one-time supporter of Glyndŵr, made the following entry in his Chronicle under the year 1415: "After four years in hiding, from the king and the realm, Owain Glyndŵr died, and was buried by his followers in the darkness of night. His grave was discovered by his enemies, however, so he had to be re-buried, though it is impossible to discover where he was laid." In 1875, the Rev. Francis Kilvert wrote in his diary that he saw the grave of "Owen Glendower" in the churchyard at Monnington "[h]ard by the church porch and on the western side of it ... It is a flat stone of whitish grey shaped like a rude obelisk figure, sunk deep into the ground in the middle of an oblong patch of earth from which the turf has been pared away, and, alas, smashed into several fragments." In 2006, Adrien Jones, the president of the Owain Glyndŵr Society, said, "Four years ago we visited a direct descendant of Glyndŵr, a John Skidmore, at Kentchurch Court, near Abergavenny. He took us to Mornington Straddle, in Herefordshire, where one of Glyndŵr's daughters, Alice, lived. Mr Skidmore told us that he (Glyndŵr) spent his last days there and eventually died there.... It was a family secret for 600 years and even Mr. Skidmore's mother, who died shortly before we visited, refused to reveal the secret. There's even a mound where he is believed to be buried at Mornington Straddle." Owain married Margaret Hanmer, also known by her Welsh name Marred ferch Dafydd, daughter of Sir David Hanmer of Hanmer, early in his life. Owain's daughter Alys had secretly married Sir John Scudamore, the King's appointed Sheriff of Herefordshire. Somehow he had weathered the rebellion and remained in office. It was rumoured that Owain finally retreated to their home at Kentchurch. A grandchild of the Scudamores was Sir John Donne of Kidwelly, a successful Yorkist courtier, diplomat and soldier, who after 1485 made an accommodation with his fellow Welshman, Henry VII. Through the Donne family, many prominent English families are descended from Owain, including the De Vere family, successive holders of the title Earl of Oxford, and the Cavendish family (Dukes of Devonshire). Gruffudd, born about 1375, was captured by the English, confined in Nottington Castle, and taken to the Tower of London in 1410. He died in prison of bubonic plague about 1412. Maredudd, whose date of birth is unknown, was still living in 1421 when he accepted a pardon. Alys married Sir John Scudamore. She was lady of Glyndyfrdwy and Cynllaith, and heiress of the Principalities of Powys, South Wales, and Gwynedd. Jane, who married Lord Grey de Ruthin. Janet, who married Sir John de Croft of Croft Castle, in Herefordshire. Margaret, who married Sir Richard Monnington of Monnington, in Herefordshire. Although not named by Lloyd, a fifth daughter, Catrin, is recorded elsewhere. She married Sir Edmund Mortimer, son of Edmund Mortimer, 3rd Earl of March, and died in 1413. Owain's sons were either taken prisoner or died in battle and had no issue. Owain had additional illegitimate children: David, Gwenllian, Ieuan, and Myfanwy. 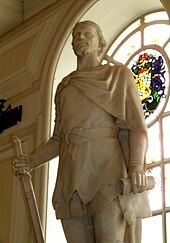 Sculpture of Owain Glyndŵr by Alfred Turner at City Hall, Cardiff. After Owain's death, there was little resistance to English rule. The Tudor dynasty saw Welshmen become more prominent in English society. In Henry IV, Part 1, Shakespeare portrays him as Owen Glendower, wild and exotic; a man who claims to be able to "call spirits from the vasty deep," ruled by magic and tradition in sharp contrast to the more logical but highly emotional Hotspur. Shakespeare further notes Glyndŵr as being "not in the roll of common men" and "a worthy gentleman,/Exceedingly well read, and profited/ In strange concealments, valiant as a lion/And as wondrous affable and as bountiful/As mines of India." (Henry IV, Part I, 3.1). With his death Owain acquired a mythical status along with Cadwaladr, Cynan and Arthur as the hero awaiting the call to return and liberate his people. Thomas Pennant, in his Tours in Wales (1778, 1781 and 1783), searched out and published many of the legends and places associated with his memory. Previously, George Owen, in his A Dialogue of the present Government of Wales (1594) had written against the Cruell lawes against Welshmen made by Henrie the ffourth in his attempts to quell the revolt. But it was not until the late 19th century that Owain's reputation was revived. The "Young Wales" movement recreated him as the father of Welsh nationalism. The discovery of Owain's Great Seal and his letters to the French in the Bibliothèque Nationale helped revise historical images of him as a purely local leader. In the First World War, the Prime Minister, David Lloyd George, unveiled a statue to him in Cardiff City Hall and a postcard showing Owain at the Battle of Mynydd Hyddgen was sold to raise money for wounded Welsh soldiers. Folk memory in Wales had always held him in high regard and almost every parish has some landmark or story about Owain. However, there is no road sign indicating the scene of one of his greatest battles at Bryn Glas in 1415. In 1808, the Royal Navy launched a 36-gun fifth-rate frigate, which it named HMS Owen Glendower. She served in the Baltic Sea during the Gunboat War where she participated in the seizure of Anholt Island, and then in the Channel. Between 1822 and 1824, she served in the West Africa Squadron (or 'Preventative Squadron') chasing down slave ships, capturing at least two. A sketch of Owain Glyndŵr as he appeared to William Blake in a late night vision. This is one of a number of such sketches known collectively as the Visionary Heads. He is now remembered as a national hero and numerous small groups have adopted his symbolism to advocate independence or nationalism for Wales. For example, during the 1980s, a group calling themselves "Meibion Glyndŵr" claimed responsibility for the burning of English holiday homes in Wales. The creation of the National Assembly for Wales brought him back into the spotlight and in 2000 celebrations were held all over Wales to commemorate the 600th anniversary of Glyndŵr's revolt, including an historic reenactment at the Millennium National Eisteddfod of Wales, Llanelli 2000. Stamps were issued with his likeness in 1974 and 2008 and streets, parks, and public squares were named after him throughout Wales. Owain's personal standard — the quartered arms of Powys and Deheubarth rampant — began to be seen all over Wales, especially at rugby union matches against the English. A campaign exists to make 16 September, the date Owain raised his standard, a public holiday in Wales. An annual award for achievement in the arts and literature, the Glyndŵr Award, is named after him. In 2007, popular Welsh musicians the Manic Street Preachers wrote a song entitled "1404" based on Owain Glyndŵr. The song can be found on the CD single for 'Autumnsong'. A statue of Owain Glyndŵr on horseback was installed in 2007 in The Square in Corwen, Denbighshire, to commemorate his life and his lasting influence on Wales. Also located on the Square in Corwen is the Owain Glyndwr Hotel. The waymarked long distance footpath Glyndŵr's Way runs through Mid Wales near to his homelands. Owain Glyndŵr came 2nd in the 100 Welsh Heroes poll of 2003/4. Statue of Owain Glyndŵr in Corwen by Colin Spofforth. In 2008, Glyndŵr University was established in Wrexham, Wales. Originally established as the Wrexham School of Science and Art in 1887, it was until the name change known as the North East Wales Institute or "NEWI". Glyndŵr was born and lived much of his life around Wrexham and the Welsh Marches. Glendower Residence, at the University of Cape Town in South Africa was named after Owain Glyndŵr. The residence was opened in 1993 having previously been the Glendower Hotel. It now houses 139 male and female undergraduate students. RGC 1404 (Rygbi Gogledd Cymru/North Wales Rugby) rugby union team is named in honour of the year Owain Glyndŵr was crowned Prince of Wales. Glyndŵr was the hero of James Hill's UK TV movie Owain, Prince of Wales, broadcast in 1983 in the early days of Channel 4/S4C. Glyndŵr appeared briefly as a past Knight of the Word and a ghost who serves the Lady in Terry Brooks's Word/Void trilogy. In the books, he is John Ross's ancestor. Glyndŵr appeared as an agent of the Light in Susan Cooper's novel Silver on the Tree, part of The Dark is Rising Sequence. For a study of the various ways Glyndŵr has been portrayed in Welsh-language literature of the modern period, see E. Wyn James, Glyndŵr a Gobaith y Genedl: Agweddau ar y Portread o Owain Glyndŵr yn Llenyddiaeth y Cyfnod Modern (English: Glyndŵr and the Hope of the Nation: Aspects of the Portrayal of Owain Glyndŵr in the Literature of the Modern Period) (Aberystwyth: Cymdeithas Llyfrau Ceredigion, 2007). ^ "'Owain Glyndwr'". Dictionary of Welsh Biography. ^ Mainwaring, Rachel (23 April 2016). "How Wales is marking 400 years since Shakespeare's death". Wales Online. Retrieved 8 October 2018. ^ a b Davies, R.R. (1995). The revolt of Owain Glyn Dŵr. Oxford University Press. ISBN 9780198205081. ^ Davies, R.R. (1995). "The revolt of Owain Glyn Dŵr". Oxford University Press. ISBN 9780198205081. Retrieved 29 March 2016. ^ a b Pierce, Thomas Jones. "Owain Glyndwr". Welsh Biography Online. The National Library of Wales. ^ Lloyd, Jacob Youde William (1881). The History of the Princes, the Lords Marcher, and the Ancient Nobility of Powys Fadog. 1. London: T. Richards. p. 197. ^ Parry, Charles (2010). Last mab darogan: the life and times of owain glyn dwr. [S.l. ]: Novasys Limited. p. 186. ISBN 978-0956555304. ^ Allday, D. Helen (1981). Insurrection in Wales: the rebellion of the Welsh led by Owen Glyn Dwr (Glendower) against the English Crown in 1400. Lavenham: Terence Dalton. p. 51. ISBN 0-86138-001-0. ^ Ian Mortimer (31 May 2013). The Fears of Henry IV: The Life of England's Self-Made King. Random House. pp. 226–. ISBN 978-1-4070-6633-2. ^ Skidmore, Ian (1978). Owain Glyndŵr: Prince of Wales. Swansea: Christopher Davies. p. 24. ISBN 0715404725. ^ Davies, John (1994). A History of Wales. London: Penguin Books. p. 195. ISBN 0-14-014581-8. ^ Gibbon, Alex (2007). The mystery of Jack of Kent & the fate of Owain Glyndŵr. Stroud: Sutton. ISBN 978-0-7509-3320-9. ^ "Glyndwr's burial mystery 'solved'". BBC News. 6 November 2004. ^ "The Society's Achievements". The Owain Glyndwr Society. Archived from the original on 20 December 2008. ^ a b c Lloyd, J (1881). The History of the Princes, the Lords Marcher, and the Ancient Nobility of Powys Fadog. 1. London: T. Richards. pp. 199, 211–219. ^ "Owain Glyndwr". Wales History. BBC. ^ "Owain Glyndŵr". Glyndŵr University. Archived from the original on 9 April 2016. Retrieved 29 March 2016. ^ Davies, John; Jenkins, Nigel; Baines, Menna, eds. (2008). The Welsh Academy encyclopaedia of Wales. Cardiff: University of Wales Press. p. 635. ISBN 9780708319536. ^ The Transactions of the Honourable Society of Cymmrodorian, Volumes 4–5. 1998. p. 9. ^ "Owen Glendower, 1808". Retrieved 3 August 2018. ^ "Owain Glyndŵr Historic Reenactment". This Week Wales. 20 August 2000. ^ "New Owain Glyndwr stamp unveiled". BBC News. 29 February 2008. ^ "About us". Glyndŵr University. 2016. Archived from the original on 8 April 2016. Retrieved 29 March 2016. ^ "UCT Residence System". Archived from the original on 1 December 2010. Retrieved 18 March 2011. Livingston, Michael, ed. (2013). Owain Glyndŵr: A Casebook. Liverpool University Press. ISBN 978-0-85989-884-3. Williams, Gruffydd Aled (2017). The Last Days of Owain Glyndŵr. Y Lolfa. ISBN 978-1-7846-146-38. Wikimedia Commons has media related to Owain Glyndŵr. Sycharth is a motte and bailey castle and town in Llansilin, Powys, Wales. Until 1996 Sycharth was in the historic county of Denbighshire, but was then transferred to the Shire area of Montgomeryshire within Powys. Sycharth Castle was the birthplace of Owain Glyndŵr. Gruffudd Fychan I, Prince of Powys Fadog from 1277 to 1284, was the youngest of the four sons of Gruffudd ap Madog, Lord of Dinas Bran. Owen Glendower: An Historical Novel by John Cowper Powys was first published in America in January 1941, and in the UK in February 1942. Powys returned to Britain from the USA in 1934, with his lover Phyllis Playter, living first in Dorchester, where he began work on his novel Maiden Castle. However, in July, 1935 they moved to the village of Corwen, Denbighshire, North Wales, historically part of Edeirnion or Edeyrnion, an ancient commote of medieval Wales that was once part of the Kingdom of Powys; it was at Corwen that he completed Maiden Castle (1936). This move to the land of his ancestors led Powys to write Owen Glendower the first of two historical novels set in this region of Wales; the other was Porius (1951). Owen, Powys's ninth novel, reflects "his increasing sense of what he thought of as his bardic heritage."